In these turbulent, stressful times we know teams are often expected to sacrifice. 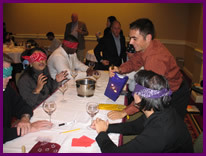 This is not one of those times - get your palettes ready for wine teambuilding! This unique event combines team challenges, lots of interaction, and plenty of fun. You become the wine experts – everyone’s success depends on it! Our Trade-off icebreaker gets everyone up on their feet, laughing, meeting other people and collecting wine expertise to share with their Wine Team. Each Wine Team presents their wine to the larger group for a tasting with helpful hints to remember it. After every wine has been tasted it’s time for the ultimate blind taste-test. How well did you explain your Pinot Noir? It’s tricky and fun and requires teams to build consensus when they choose their final answers. Whose Wine is It Anyway is a fun and delicious collaborative program in a relaxed, informal setting. It’s perfect before or after dinner. If you’re looking for a creative alternative to another boring cocktail hour, here’s your solution! We guarantee there’ll be no “whining” from your team members about this activity – everyone will walk away with a “grape” team feeling. And you’ll never send wine back because it’s too old again. Orson Wells said, “We will drink no wine before its time”...Well, now’s the time. Uncork your team’s potential! This program usually does not include a debrief. If you would like a debrief and have enough time we recommend the WI-NOT: Raiders of the Lost Cork program. 60 to 90 minutes. Whose Wine is It Anyway is perfect either before or after dinner and is a smart and creative alternative to a cocktail hour. Enough room for each team (5-10 people per team) to sit at a round table.